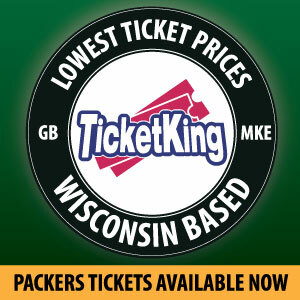 This past week versus the Vikings was one of two regular season games of which I don’t have tickets. Having no tailgate prep work Saturday, I took a trip in the opposite direction to my hometown of Highland, Wisconsin. Where for homecoming, at the last minute, we threw together a 20th class reunion. A graduating class of only 32, we’ve known each other since kindergarten. On cue, my classmate Ryan rolled in with a Vikings hat and matching can koozie. Last time we’d seen each other was at Lambeau Field on January 3, 2016. I think he helped poison me with Lime-A-Ritas that day. “Sarah. The game is going to end in a field goal; it seems like it always does” Ryan said. Well, it did Ryan; sort of….until next time. I did seize the opportunity to message Ryan ‘laces out’ Monday morning. It’s cool; we’ve known each other since kindergarten. Let’s be clear, the Packers were the better team on the field Sunday, and a tie is like kissing your cousin. Just like you, I know my other classmate Clint would agree with the above. Clint missed Highland’s homecoming and the 20th reunion festivities because he had tickets to the game. Too much information you say? Nah, it’s cool; we’ve known each other since kindergarten. One VIP that didn’t miss his homecoming was Jerry Kramer. 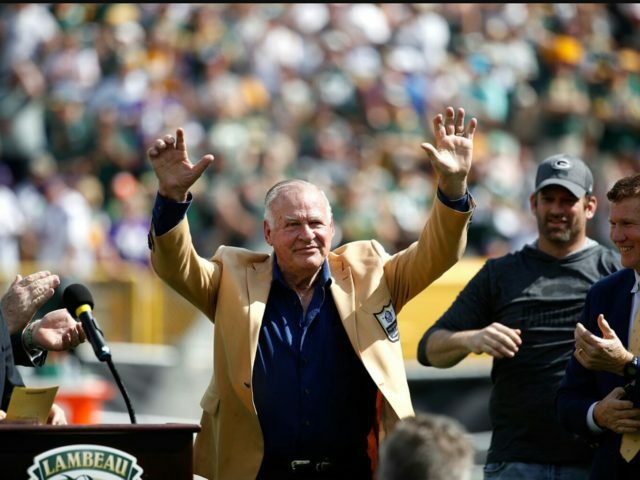 After 50 years #64 returned to Lambeau following his 2018 induction into the Pro Football Hall of Fall to have his number retired in the Packers ring of honor at halftime. Did you know that Mr. Kramer was also a placekicker? I certainly learned something new! Relating to field goals Jerry Kramer was 29/54 or 53.7% and extra points he was 90/95 or 94.7%. Maybe I’ll message Ryan suggesting a Viking’s offensive guard kick field goals…………Remember, it’s cool, we’ve known each other since kindergarten. This week I’m most looking forward to week three versus the Redskins; I always look forward to hearing “Go Pack Go” on the road. I’m nervous about the field conditions at FedExField and have it in my head that it’s a giant turf monster. I’ll have to snap out of that! This entry was posted in Packers 2018-2019 Season, Packers History, Sarah Szejn and tagged #64, FedExField, Green Bay Packers, Highland, jerry kramer, kindergarten, laces out, lambeau field, Lime-A-Rita, Pro Football Hall of Fame, Redskins, ring of honor, Turf, Vikings, VIP, Wisconsin. Bookmark the permalink.